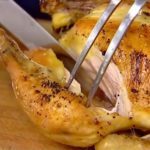 Remove and discard the chicken giblets. Pat the outside dry. Liberally salt and pepper the inside of the chicken. Cut the lemons in quarters, place 2 quarters in the chicken along with the garlic and reserve the rest of the lemons. 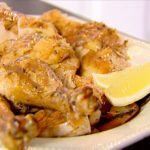 Brush the outside of the chicken with olive oil and sprinkle the chicken liberally with salt and pepper. Tie the legs together with kitchen string and tuck the wing tips under the body of the chicken. 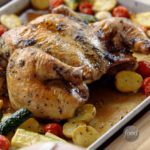 Place the chicken in a small (11 by 14-inch) roasting pan. (If the pan is too large, the onions will burn.) 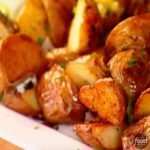 Place the reserved lemons and the sliced onions in a large bowl and toss with 2 tablespoons of olive oil, 1 teaspoon of salt, and ½ teaspoon of pepper. Pour the mixture around the chicken in the pan. 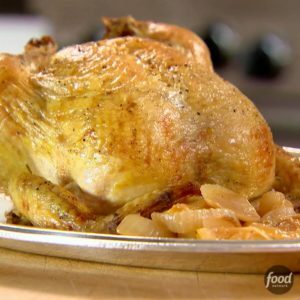 Recipe of the Day: Ina Garten's Engagement Roast Chicken💍Save the recipe: https://foodtv.com/2RHxhir!